For the first time, these 50-ton armored monsters will be seen hurtling over 2-meter embankments and rugged terrain at full throttle. In April, Uralvagonzavod (UVZ) - which controls the Russian heavy tank market - supplied the army with its first T-90M modernized tanks, pimped up like cars straight out of West Coast Customs. The UVZ design team began the modification process with the vehicle’s beating heart - its engine. The motor was given a new automatic transmission system and over 1000 bhp of raw power. This allows the almost 50-ton brute to race across rough terrain at a speeds of up to 60 km/h. 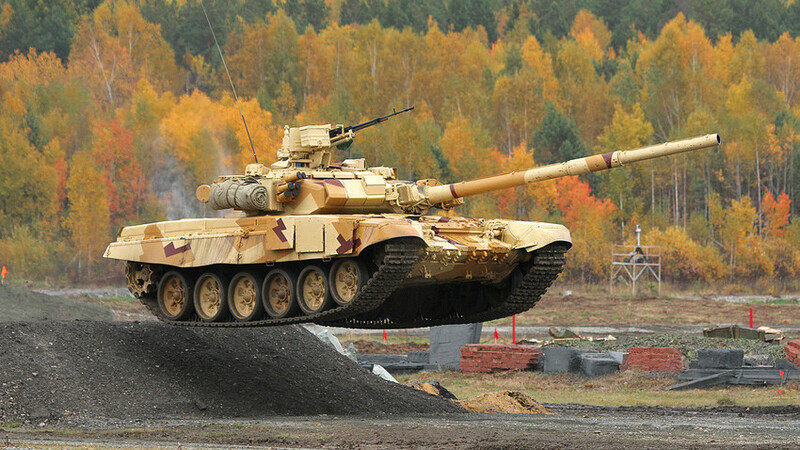 Only the turbocharged T-80 with a “jet” engine (link to our text) and the latest T-14 Armata can beat that. “At military tech expos, our guys like to do the following trick: They drive the tank at top speed up a mound or springboard and take off. The tank strikes the ground and hurtles on at full throttle as if nothing happened. You wouldn’t think that 50 tons of iron had just smacked into the road,” a defense industry source told Russia Beyond. This, he says, demonstrates the sheer power of the new engine, and more importantly, the robustness of all the components and suspension of the modernized vehicle. "This machine can survive in any conditions - Arctic, desert, swamp, you name it. All bases are covered." If the crew is indeed “lucky” enough to end up in Arctic, desert, or swamp conditions, the new on-board computer with satellite navigation and enhanced air conditioning will keep them firmly on course and cool. As stated by UVZ, the thermoelectric air conditioner works both at high and low temperatures, and can survive ultra-high shock and mechanical loads. The T-90M is equipped with an additional diesel generator providing an uninterrupted supply of electricity when the tank is stationary, so the air conditioner does not eat up the battery. "The tank's air conditioning consists of several cooling units. These units can be switched on and off autonomously, providing smooth regulation of the flow rate and direction of the cold air," reads the report. That's not all. The tank is also encased in dynamic protective armor capable of withstanding the most hi-tech anti-tank missiles. "The number of T-90s to be modernized to this standard will be determined on the results of combined arms trials. The Ministry of Defense will likely make a decision on the final order within a year," says TASS military analyst Viktor Litovkin.